I am impressed with Forty Hands Cafe. 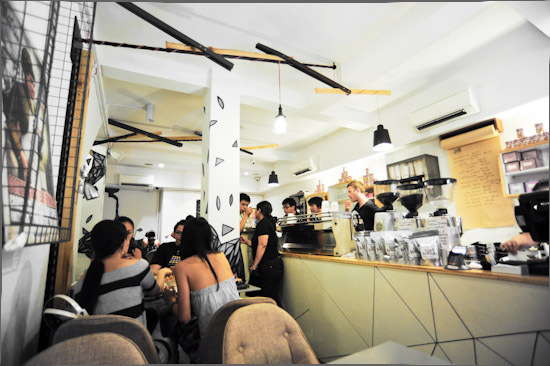 Despite its (ulu) location within a shop house in the Tiong Bahru area, the cafe has been doing very well since its opening. However, I felt that the food was average. They are always crowded, though, especially for weekend brunch. Also, I didn’t fancy the narrow layout of the place. Having said that, 40 Hands Cafe is still one of the nicer cafes in Singapore. 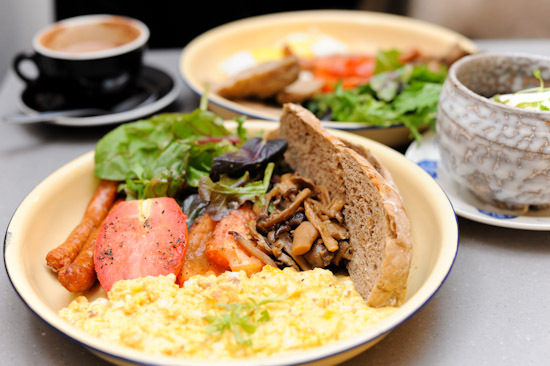 They have a few sandwiches (prices ranging from $8-$10) on the menu, but hey, breakfast food is all about eggs! 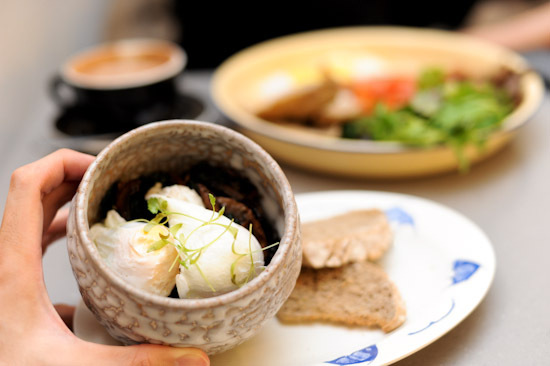 The egg items like the Eggs Benedict, Baked Eggs and Big Breakfast are priced below $20. We had two sets of the Big Breakfast: one with scrambled eggs and the other with poached eggs. The portion was generous and it came with mushroom, grilled tomatoes, sausages, eggs, toasts and greens. The Baked Eggs, on the other hand, was extremely salty and we didn’t manage to finish it. And of course, people go to Forty Hands Cafe for the coffee. 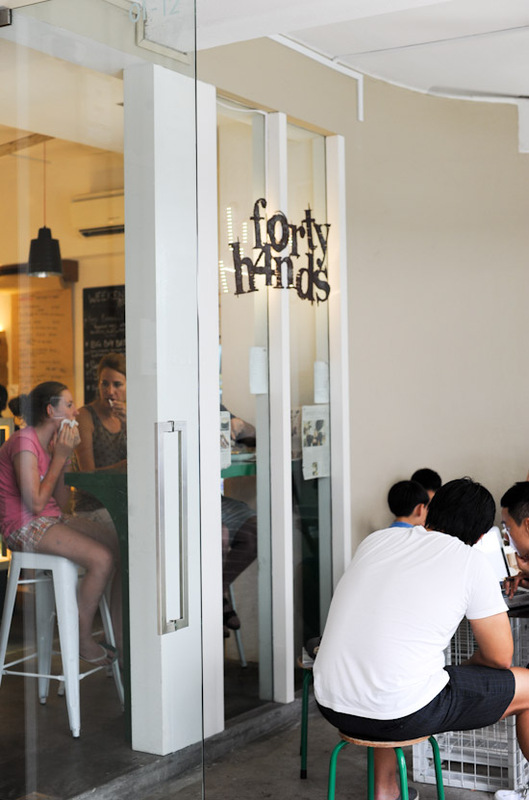 Known amongst the array of coffee joints, 40 hands is one of the few cafes that serve up the best coffee in Singapore. It is quite difficult to find Forty Hands Cafe. Your best bet is to take a cab and hope that the driver knows where is Yong Siak street (near Tiong Bahru market). Book lovers will also be happy to know that the popular BooksActually has relocated to the same street. I think the idea of visiting a book shop after a good Sunday brunch is very appealing. Thanks for this review. I have been curious about Forty Hands for a while, mainly due to its unique location in a very charming neighbourhood. Was expecting a quiet ambience, although from your pictures it looks like a lively and bustling coffee joint. One thing that I have heard rave reviews about is one of their pastries… with red bean filling IIRC. It should go well with coffee. If I’m not wrong, Books Actually is still collecting donations to help Bob the famous Tiong Bahru cat. Feline lovers may wanna pop by. Well I do agree with ladyironchef that the food is average. What’s up with the tau sar baos? I’m not impressed. I’d rather buy them at the neighbourhood coffee shops. The place is bit too stuffy although it does have a nice cosy ambience. The coffee is also one of the best in Sg. I didn’t like both my experience at Forty Hands. I find the deliberate mix of those retro styled plates and utensils against the contemporary decor a bit been-there-done-that and it falls quite flat in terms of the coffee and the cakes. The staff’s recommended Carrot Cake/Banana Cake both came off dry and crumbly while the ice coffee tastes like Nesquik. My partner had the regular brew and it really isnt something to shout about either. I think the place is over-rated and the price, quite expensive for that kinda standard. Thanks for the review. Had not seen it – seems laike amust try for a coffe addict. My favourite coffe I otherwise find at Papa Pahleta. Do try that out. heard a lot of hype about the place having the best coffee in SG. but in my opinion, its overrated.